Natural body care products are certainly gaining new heights of popularity as more and more people, particularly women, are looking for organic and more natural ingredients for their beauty and personal care essentials. While you think that normally natural or organic products would cost you a bomb, I was recently introduced to a brand of premium yet affordable chemical free personal care products called Human Nature in Malaysia. Human Nature is a socially responsible personal care products brand and their natural products are suitable for men, women, kids and babies. Not just in Malaysia, Human Nature also has presence in the USA, Philippines, Singapore and Dubai. The Human Nature goodies for Naomi and me to test. Other than applying day cream before leaving the house, facial wash twice a day and skin toner before bed time are my daily skin care regimes. Speaking of facial wash, I think a good basic facial wash is the one which lathers away every speck of dirt, make-up, sweat and oil without leaving our skin dry nor cause pimples. Also, they don't necessarily have to be expensive. Human Nature's Nourishing Facial Wash and Face Toner. The Human Nature's Nourishing Facial Wash that I tested works well for my normal skin as it is packed with Tomato Extract. The tomato extract here acts as an antioxidant agent to soothe and repair skin while retaining moist and making skin smooth and soft. I think this Nourishing Facial Wash is really soft and personally I really fancy this facial wash's light fruity fragrance. Also, this non-creamy facial wash gently cleanses and refreshes skin without irritating nor leaving our skin feeling "tight". Albeit, this facial wash doesn't really generate voluptuous foam which some people, including myself, like. Apply your face toner every night! Next, I must tell you that I am a huge fan of facial skin toner. I apply face toner before I turn to bed to give me a clean and fresh feeling before I end my day. From my experience, using a toner every night before bed would drastically improve my skin condition because skin toner removes the residue from make-up and even the cleanser that I just used to get rid of dirt. I've tried using some alcohol-based skin toners before but hey, they sting and have pretty strong alcohol smell. Anyhow, fret not; the above will not be the case for Nourishing Face Toner as it contains no alcohol and other harmful chemicals. I apply this toner on my face every night and in return, I get a fresh and clean face (that smells pleasant!) to keep my skin looking at its best the next day. When I was younger, I used to be so proud of my luscious black hair and lots of people complimented (and envied) me on my thick hair. However, right after I graduated from high school I was so into frequent hair colouring and rebonding. As a result, I had dry and damaged hair which subsequently led to major hair loss problem. Furthermore, few months after I gave birth to Naomi, I experienced severe post-partum hair loss. My hair got thinner and thinner and lately, I had to turn to perming my hair permanently to make my tress looks thicker and good looking. Another chemical exposure on my hair! All this said, I am bound to use anti hair-fall shampoo and conditioner every time I wash my hair simply because I cannot afford to lose so many strains of hair in a day. Save your hair before it's gone! Natural Strengthening Shampoo and Conditioner with Soothing Aloe. Natural Strengthening Shampoo with soothing Aloe scent is infused with hydrolized protein to fortify our hair and the Philippine coco nectar in it provides amino acids, vitamins and minerals. In tandem with anti hair fall shampoo, I religiously use Hair Conditioner as well to nourish my hair and prevent further hair fall. I have yet to try these products for long but I can see that nowadays I lose lesser hair during and immediately after shampooing. Have I mentioned that my hair has this long-lasting refreshingly clean smell too after I use this duo? They are indeed one of the best smelling shampoos and conditioners I've found in the market so far. And my husband is of the same mind with me on this one. Update in end of July 2014: I have finished a bottle of Natural Strengthening shampoo and conditioner and have decided to get them again on my personal account. Since I finished them last week and went back to using the 'old' brand shampoo and conditioner that I used before I was introduced to Natural Strengthening hair care products, I've been losing more strands of hair when and after washing my hair. It's really creepy to see how much hair strands I lose every time I sweep the floor in my house. I think the natural aloe extract used in these Human Nature products really helps for reducing hair fall. Well, at least in my case and that's why I am going back to them, at least for now. Baby skin needs particularly careful protection because it can be up to ten times thinner and more sensitive than adults', hence it damages easily. We should, therefore, use baby care products that are compatible with our little one's skin. Human Nature's Baby Care Set. Although Naomi is no longer a baby per se, I tried bathing her with Human Nature's All Natural Baby Wash. This baby wash is made with lavender, rosemary and chamomile scents and it is great to nourish, protect and relax our baby's skin. However, I personally think this baby wash smells a little to strong for my liking and doesn't foam much either - I guess because it doesn't contain any synthetic foaming agents or something like that perhaps? As for the baby lotion, admittedly I was not a big user of baby lotion before this. These days, I realized that Naomi's feet skin was not so soft and pretty dry. As such, I tried to moisturise her feet with this baby lotion to keep them soft and smooth like baby bums. It is non-greasy and perfect to rehydrate little tot's skin. After continuous use for few days, I can see how softer Naomi's feet skin had become and I think from now on, I will stick to slathering baby lotion on Naomi's skin after bath everyday. Just applied the lotion on her feet and some wonder oil on Naomi's scars. Have I told you that my little girl is so active that I often feel that she is very much like a mischievous little boy? She runs and jumps around, climbs here and there and falls many times too. So unladylike. That's why Naomi's feet, especially, have so many boo-boos from her falls or insect bites that she scratches too much to the point that her skin breaks and bleeds a little. I really hate her habit of "playing" with or scratching her scars on her feet excessively because it only makes them worse. When I read that Human Nature's all-purpose Wonder Oil, which contains pure and premium grade sunflower oil, helps heal little bumps, boo-boos and insect bites; I applied few drops of this non-greasy baby oil to Naomi's boo-boos and mosquito bites on her feet. After 3 days of application, I noticed that Naomi's boo-boos and scars on her feet were getting better. More importantly, she doesn't scratch or touch her scars on her feet as much as before. For the sake of practicality, I always prefer 2-in-1 Shampoo and Body Wash for my child's daily bath and hair wash. 2-in-1 Shampoo and Body Wash products save space in my bathroom and they are so handy to be packed during travelling as well. Human Nature Best Seller 2-in-1 Kid Shampoo! Human Nature's Tangerine Kids Natural Shampoo and Body Wash is my newly found favourite product for Naomi because it's so easy to use, convenient and has great smells too. Bathing time is so fun with this great-smelling shampoo! What I love the most from this best-seller product is its zesty citrusy scent - It is just so yummy (that I wanted to eat it!). Thanks to its unique protein care system, this 2-in-1 kid care nourishes and moisturises little tyke's both hair and delicate skin. Finally, I noticed that the shelf life of these all-natural products are generally quite short. Roughly they will expire within a year or so. I reckon, this must be because of no harmful chemical preservatives present in these products so it's best to finish them quickly before their expiry dates come. Just so my blog readers get to enjoy the goodness of natural personal care products as well, Human Nature is happily sponsoring some of their products for you! 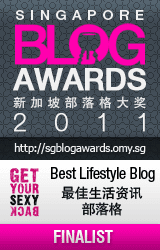 Thank you for reading this blog and hope you take delight in this giveaway! THREE (3) lucky blog readers will walk away with a bottle of 200ml Tangerine Kids Shampoo and Body Wash plus a product of your choice (choose from here, except the bundle packs)! SHARE this giveaway contest on your Facebook, Twitter, Instagram or other social media platform. LEAVE A COMMENT below this blog post and tell me: Your name, city where you reside, email address and the Human Nature product that you would like to win. This giveaway is open to readers in Malaysia only and ends on Sunday, 29 June 2014. Three winners will be picked and contacted via email (and announced here in this blog post)! Please don't forget to state your email address in your comment so we can contact you if you win this contest. Good luck and have heaps of fun with this giveaway! Congratulations to you, ladies! An email to claim the prize will be sent to the respective winners soon. So winners, please try to respond to our email the soonest you can. 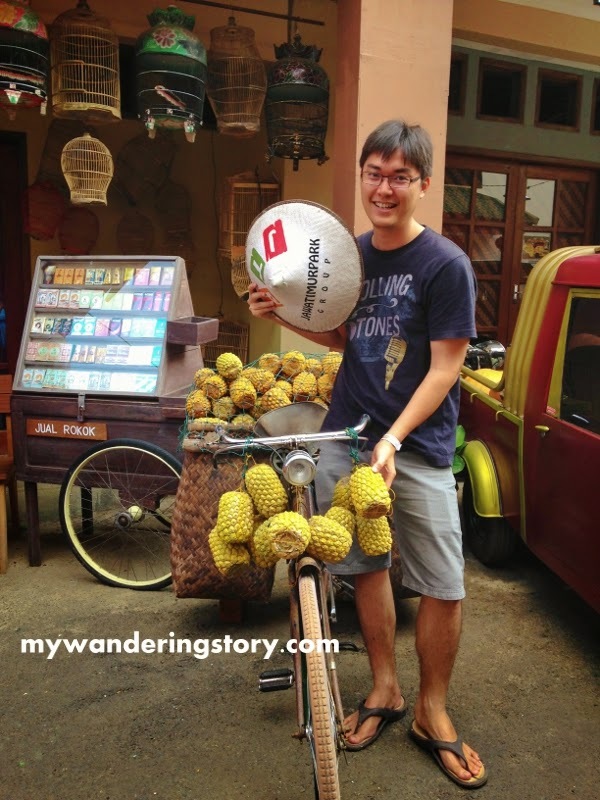 On our third day in Bali, I didn't really make detailed itinerary. 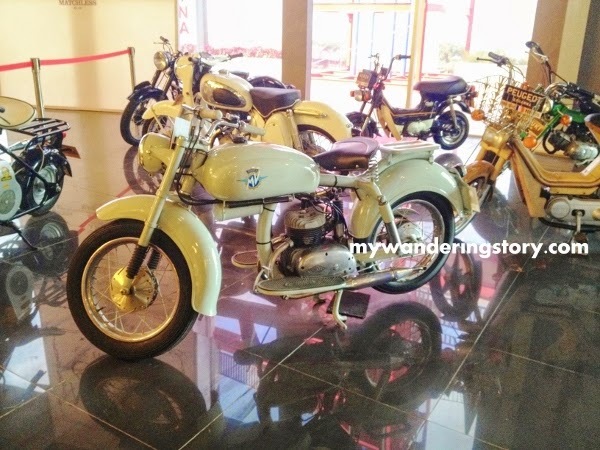 I was just thinking that perhaps we all could just explore some famous places or beaches in the southern part of Bali so we would not waste so much time on the road. In addition, I felt a little lethargic on that Sunday morning. Painful haemorrhoid visited this pregnant woman again so walking was not an easy feat for me. At around 7am, my husband already woke up and wanted to test the hotel's swimming pool. Since Naomi chose to sleep in her grandparents' room that night, I went down to the pool with my husband. I don't really fancy taking a dip early in the morning because I know the water would be so cold. Thus, my husband swam alone and good for him; he had the whole swimming pool just for himself. He swam for about 30 mins before we all headed to the hotel's restaurant for our Continental breakfast. Chilling by the pool for few minutes. After breakfast, our driver picked us up at the hotel's lobby at around 9am and the first destination that I picked for that day was Pura Luhur Uluwatu. My friend who had just been to Bali a week before I arrived strongly suggested us to visit this place because this Balinese sea temple has a not-to-be-missed magnificent view, especially during sunset. Indian Ocean from Pura Luhur Uluwatu. 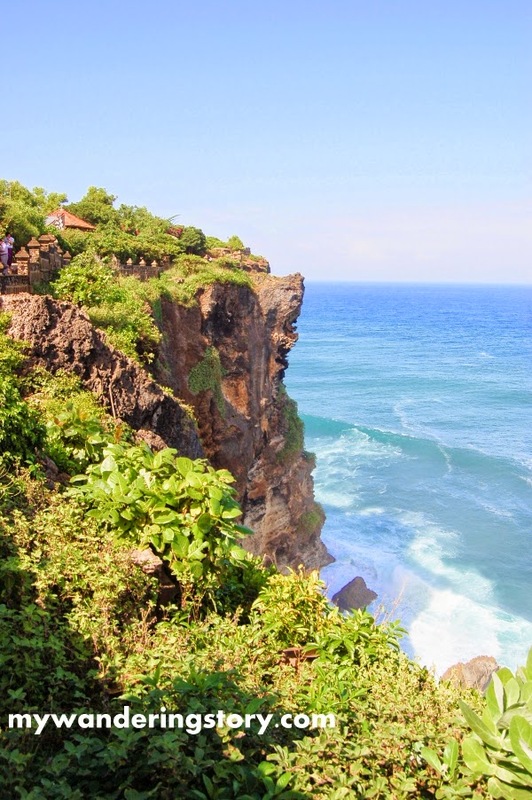 Seemingly Uluwatu is located not that far from Kuta, as compared to Bedugul. I think in an hour or so, we've arrived to the destination. I was surprised when I was told that this place hosts a lot of aggressive monkeys because I didn't expect to deal with monkeys during this Bali visit. My husband, Naomi and I had pretty traumatizing experience when visiting a tiny island in Langkawi which was home to hungry and aggressive monkeys, so I would rather not to deal with them again. Nevertheless, since we're there already, we bought the tickets to enter this temple and the entrance fee was Rp 20.000/pax. Just before we moved on to the temple area, our driver briefed us to keep all of our belongings inside our bag, try not to bring any food nor wear sunglasses or other accessories and bring a stick from a random tree branch to chase the monkeys away in case they came near us. On the way to reach the main temple area. Forget about the monkeys as the moment we reached the temple, I was totally wowed with the spectacular view of the temple which is located on the edge of a steep cliff above the surf breaks of southern Bali. As one of the key six temples in Bali, Pura Luhur Uluwatu is definitely one of the top islands to go to in Bali as it has direct views overlooking the beautiful Indian Ocean. My favourite spot for taking pictures in Pura Luhur Uluwatu. We didn't really explore the inner part of the temple nor the small forest surrounding the temple but we took a lot of nice photos here as the view from the serpentine pathway on the cliff side was just simply breathtaking. FYI, I don't think there is a need to hire a 'local guide' to explore the pura because everything is pretty straightforward here and the area to explore is not that big, unless you are keen to hear more about the pura's history. Also, it is not necessary to buy the expensive bananas to feed the monkeys. At the ticket counter, we were asked to buy a small pack of sliced bananas for Rp 20.000 so they monkey wouldn't attack us, but we declined. Just me and the temple which I didn't enter. This is another place that is not stroller-friendly in Bali because there are so many steps involved to get to the main temple area. Both my husband and Dad carried Naomi's stroller when we had to go down or climb the steps. Further, there was no bad incidents with the monkeys. These guys were obviously 'calmer' than those in Langkawi so we had no problem wearing sunglasses or taking photos with giant DSLR camera or hand phone here. After Uluwatu, we opted to go for some souvenir shopping and our driver took us to Krisna Oleh-Oleh Bali in Kuta. Krisna indeed sells a lot of typical Balinese souvenirs, shirts, printed/floral pants, snacks, beauty products and so on. However, my husband and I didn't really buy that many souvenirs from this shop because we thought the quality of the shirts and souvenirs sold here was, in my opinion, not so good. I purchased some packs of Balinese peanut snacks to bring back to Malaysia instead. By the way, my haemorrhoid was killing me that afternoon and I was so tortured having to walk around this huge shop. I constantly sought for chairs and sat on the employee's chair whenever I found any. I was so happy when my Mom finally finished her shopping at this shop and headed to the cashier counter! 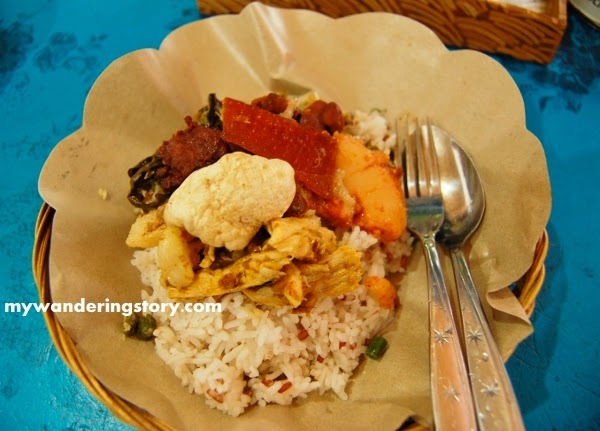 Our next agenda after shopping was eating another famous Balinese cuisine for lunch. 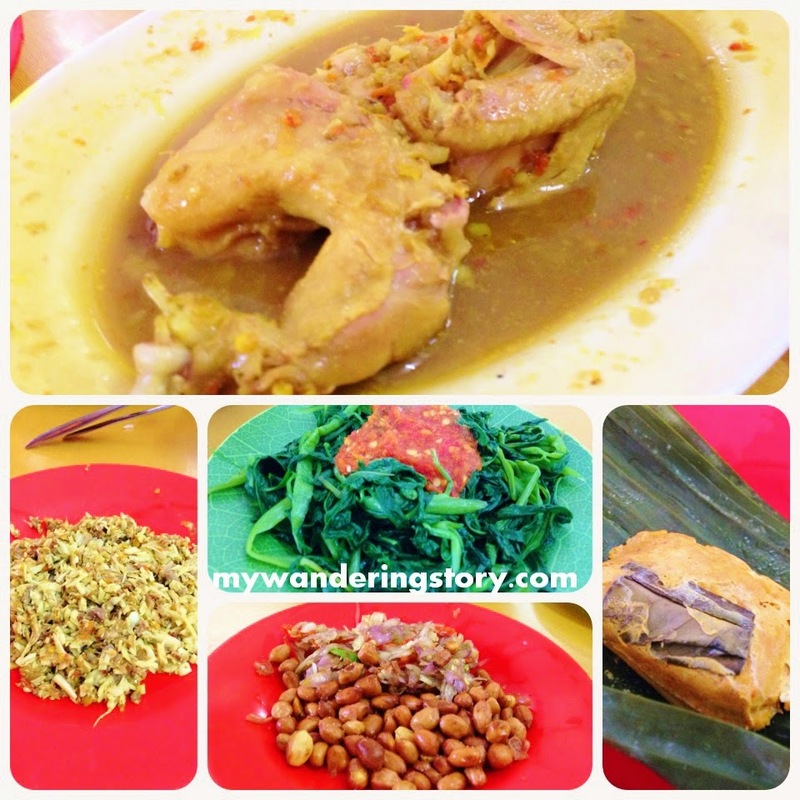 This time around, I chose to eat Ayam Betutu and our driver drove us to a very crowded and famous Ayam Betutu Khas Gilimanuk Restaurant in Kuta. I liked Ayam Betutu much better than Nasi Babi Guling but this surely a very fiery spicy dish. Almost all the tasty Balinese dishes sold in this restaurant were all spicy and not suitable for kids. 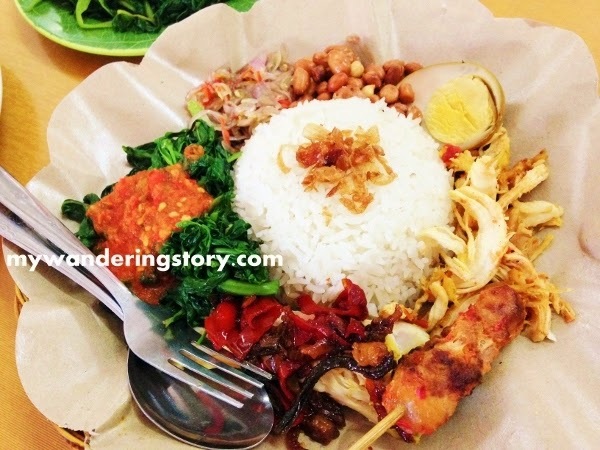 My Mom ordered Nasi Soto Ayam, which is not traditional Balinese dish, for Naomi because it's not spicy at all. Nasi Campur Bali for my husband. After lunch, I told my family that I could not walk far any longer because my haemorrhoid hurt me badly and I was very tired. I just wanted to lie down in my hotel room. They all didn't mind and advised our driver to go back to our hotel first and asked him to pick us up again at the hotel's lobby in 2-3 hours' time. Just before we got back to our hotel, we made a stop at a random shop by the street to buy a swimming float for Naomi. 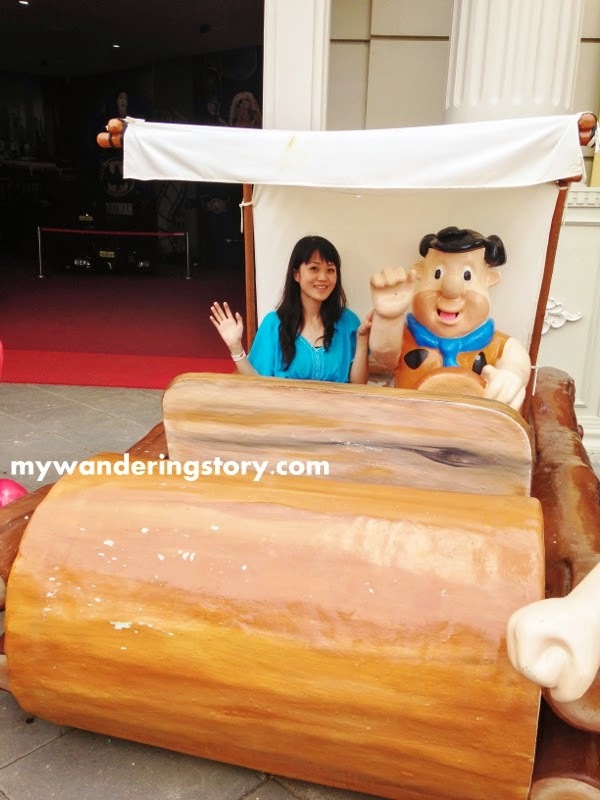 Who knew that Naomi decided to act very naughty, sat on the float inside the car and bit it? So yeah, by the time we reached the hotel, Naomi's new float was almost flat. 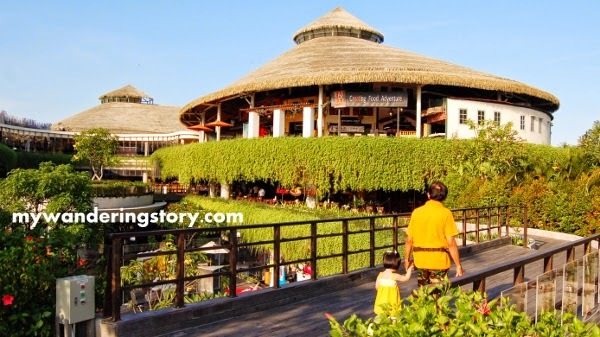 At around 4pm, our driver came to the hotel and while we originally planned to go to Nusa Dua or Tanjong Benoa for their beaches, we cancelled this plan and went to the largest mall in Kuta, Beachwalk Shopping Center. 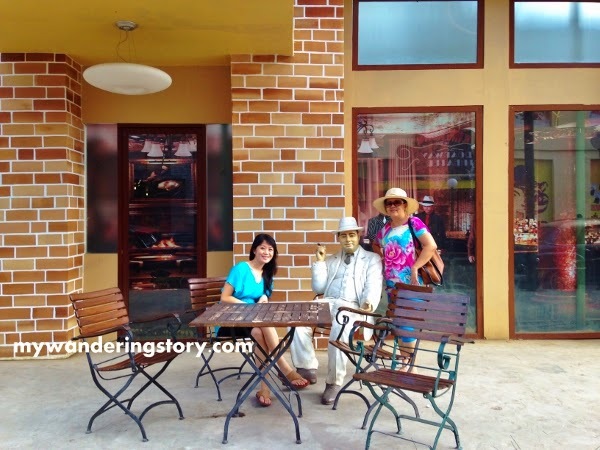 In front of Beachwalk Shopping Center. 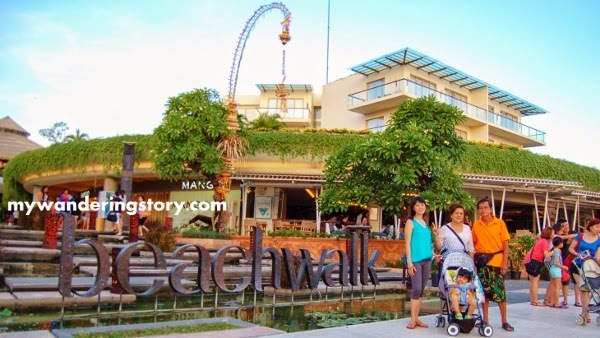 Beachwalk Mall is indeed a very interesting nature-inspired retail hub. We didn't shop much there but managed to check almost the whole place, open-air garden and canteen. Naomi loves the garden here. After checking out the mall, my parents were lazy to go out again so we're back to the hotel and ate Chinese food at a restaurant in front of our hotel for dinner. My husband entertained Naomi at the hotel's kid room before dinner. This marks the end of our second full-day in Bali. Car Rental: Puri Bali Rent Car. 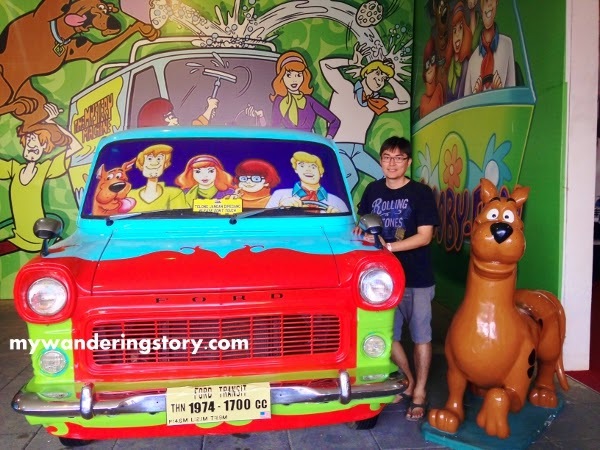 Car rental was Rp 350.000/day for Kuta area, including driver for 10 hours and petrol. Driver Overtime cost Rp. 35.000/hour. As Naomi didn't get the chance to swim or play water in the hotel's swimming pool during our stay in Bali, on the morning of our very last day in Bali, we brought Naomi to have some fun at the hotel's swimming pool. My husband fixed Naomi's float earlier that morning and it was around 8.30am when my parents brought Naomi downstairs. There were many other kids swimming in the pool as well so Naomi got more excited when she saw them. All of us, including my parents, joined the fun in the water with Naomi. The water was so cold. Brrr...! Our morning swim session that day didn't last long because we saw Naomi was shivering already. As dramatic as usual, we had to drag Naomi out of the pool because we didn't want her to get cold from swimming too long. Upon checking out, on our way back to the airport, we dropped by Hawaii Bali, another well-known souvenir shop in Bali. I think the range of products sold, especially the clothes, were better and more interesting than those sold in Krisna. The goods sold here were generally cheaper as well and we bought quite a bit of shirts, pants and dresses from this shop. Done with the shopping, off we went to the International Airport to fly to my home town for another one-week stay at my parents' house. So, this is goodbye for now, Bali. That's all for our 4D3N stay in Bali a couple weeks ago. About two weeks ago, I took my little family and parents for a short trip to Bali. 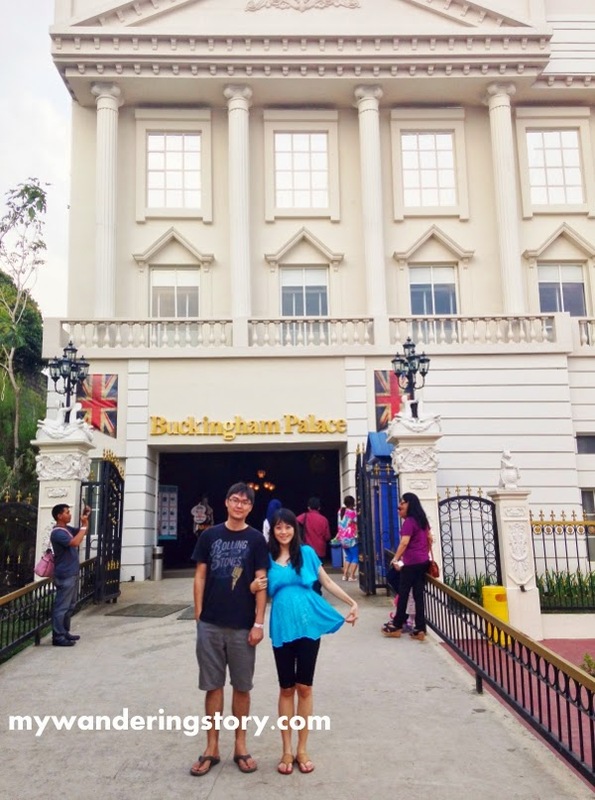 As it's been a while since my husband and I had our overseas getaway (and I was yearning for one!) 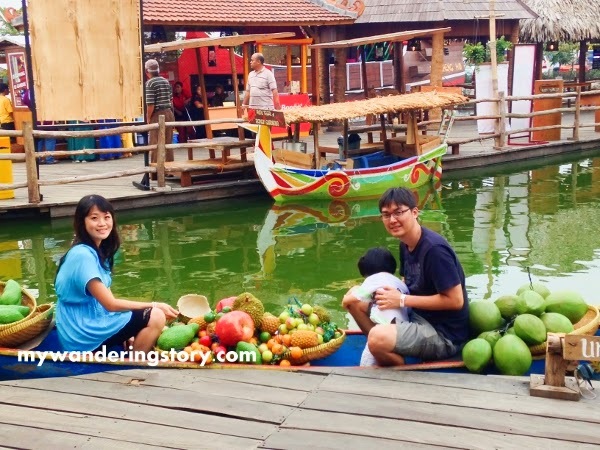 plus the air ticket from Kuala Lumpur to Bali was cheaper than the air ticket from Kuala Lumpur to Surabaya at the time of booking; we agreed to go to Bali for sightseeing before going to my home town. I asked my parents to join us as well so they can have a short holiday with their only grandchild in Bali and they didn't mind. Moreover, my parents could be a huge help in babysitting Naomi during the whole trip. After much waits, the day for us to fly to Bali finally arrived! 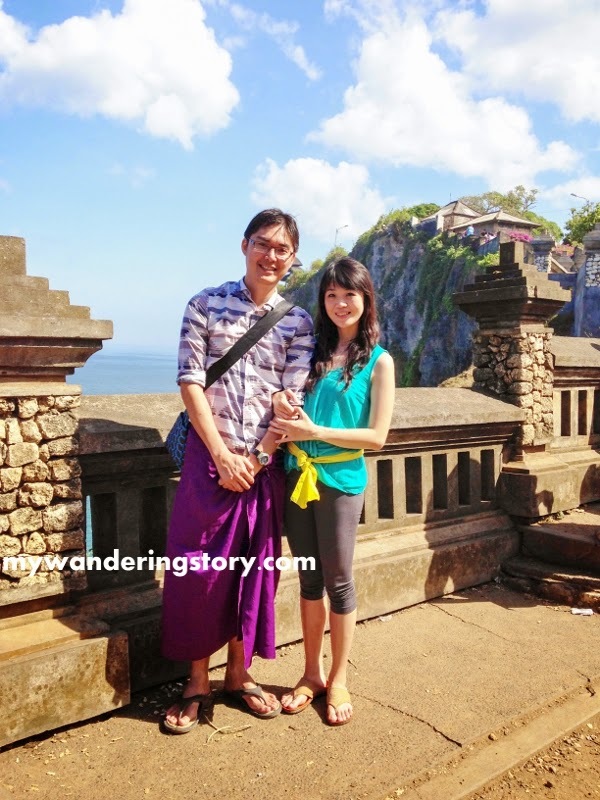 This was going to be my husband's and Naomi's first visit to Bali. My parents and I had visited Bali several times but the last time I went to Bali was close to 5 years ago so I was sure Bali must have changed a lot. 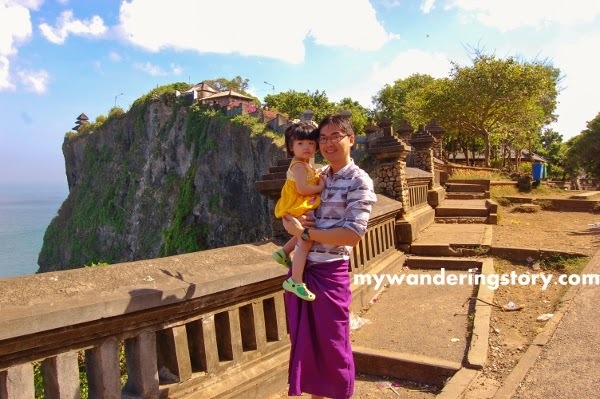 My grand plan for our Bali holiday this time around was to make the whole trip as free and easy as possible, considering the facts that I was almost 5 months pregnant and we had a very active toddler in our pack. 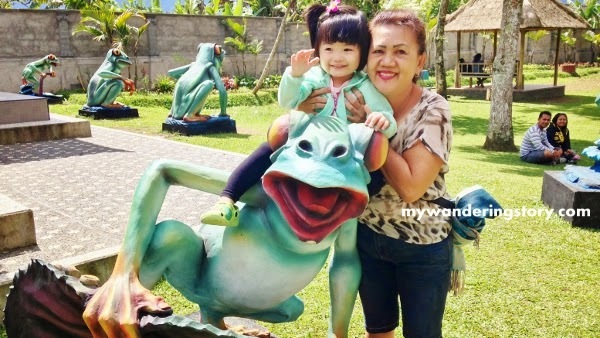 While my plan was to make the trip to be less hectic, I hoped to check out some must-see tourist attractions for my husband and taste some famous Bali cuisines as well. Departing from KLIA 2, we touched down in Bali at around 7.30pm. My parents who flew to Bali straight from my home town already arrived at Ngurah Rai International Airport a couple hours before we landed. Naomi refused to be carried by my parents when she first saw them in the airport but once we were in the cab, she was okay with my parents and could play with her grandparents whom she had not seen in 6 months. Welcome drink from the hotel upon check-in. The taxi fare from the airport to our hotel was so expensive, especially since our hotel's location turned out to be located just nearby the airport. I felt kind of cheated but this is what happened if you're not familiar with the area you are travelling at and desperately needed that taxi ride somehow. We rented a car and a driver to take us around Bali. 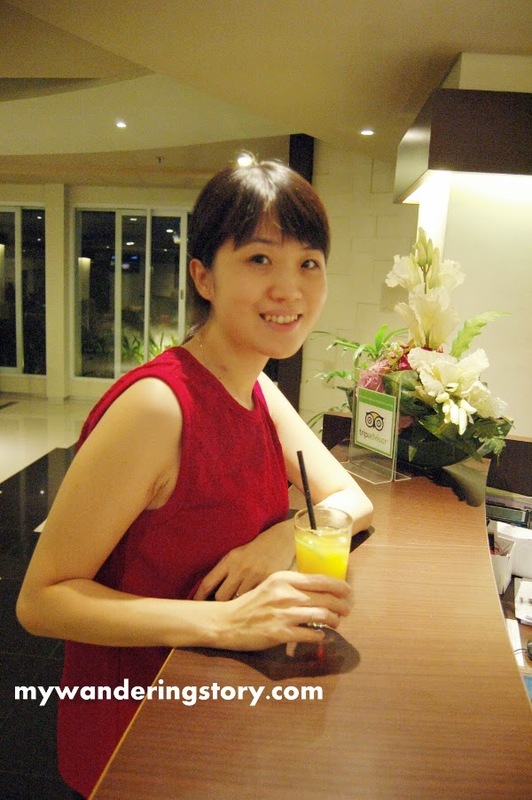 As planned, the driver arrived to our hotel at around 9am and shortly after our breakfast at the hotel, I discussed with him some places in Bali that I wanted to visit. For day 1, the driver suggested some tourist spots which routes were not too far apart from each other and can be completed in 10 hours or so. Just woke up: Naomi's first morning in Bali. 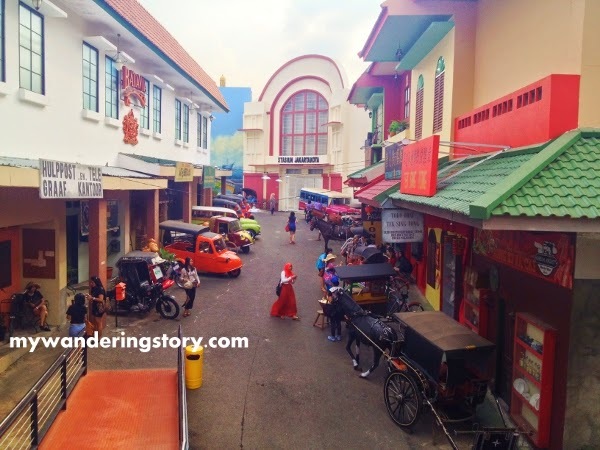 Here are some places that we visited on our first day in Bali. 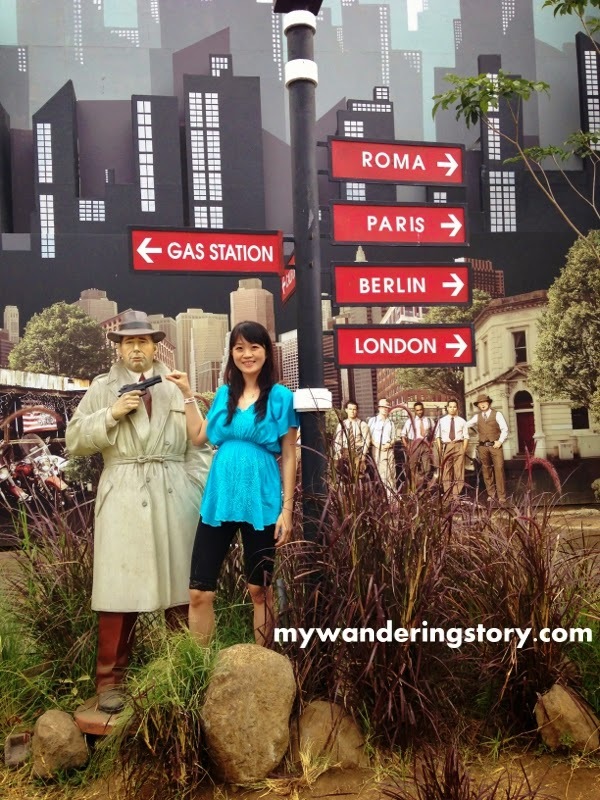 Some of these places I've gone before but I went back there to show my husband Bali's important and famous tourist spots. 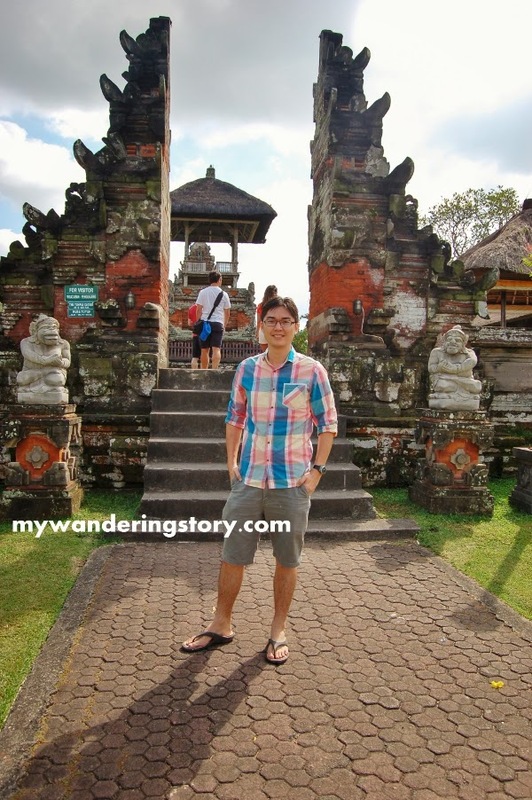 When we first hit the road that morning, my husband was so fascinated with the amount of pura (or Balinese Hindhu temples) and the overall surroundings in Bali. He kept taking pictures of them from the car. It was also happened to be Kuningan Day in Bali so we got to see Balinese people wore their traditional clothes and their offerings at the pura around the villages and cities. 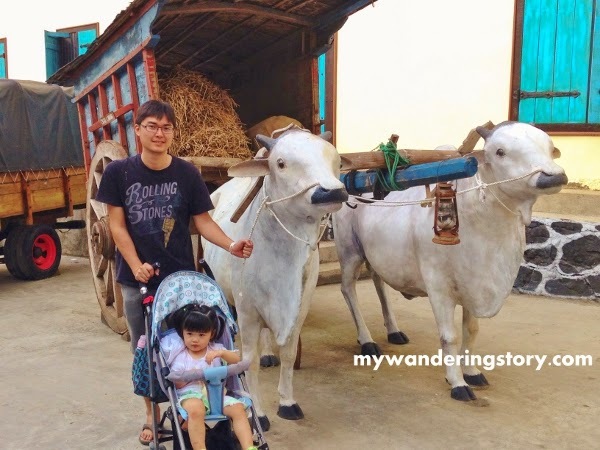 After a while, my husband stopped taking pictures of pura because he realized pura is literally everywhere in Bali and only took pictures of those big pura at the tourist destinations. 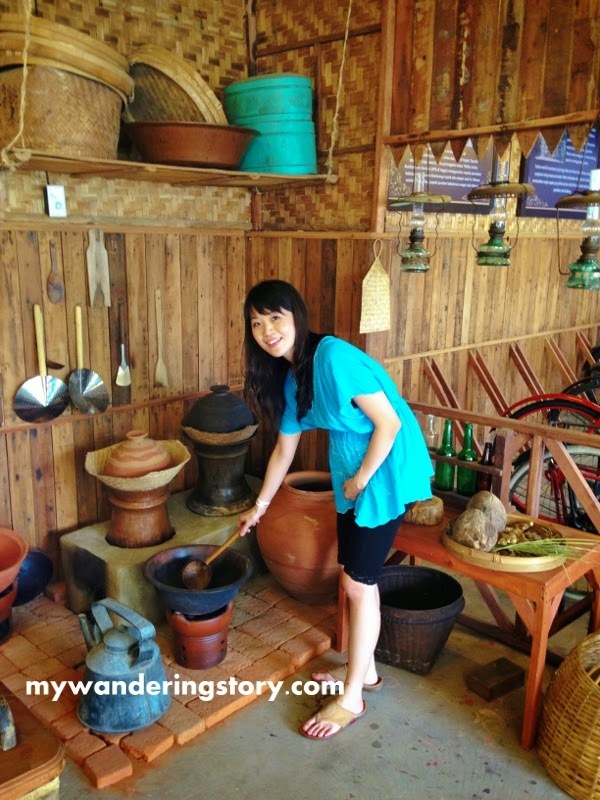 The first tourist destination we visited in Bali was Pura Taman Ayun. It is one of the most important temples in Bali and welcomes visitors. My husband at Taman Ayun Royal Temple. 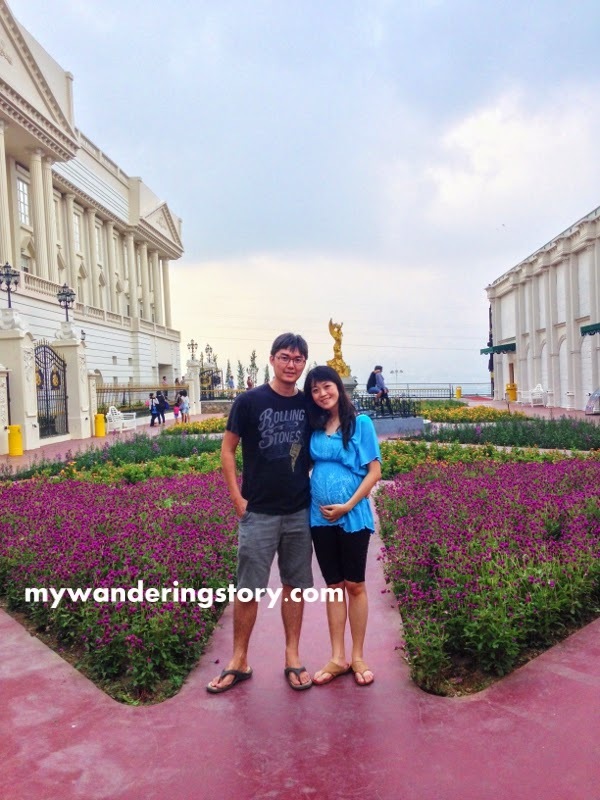 18 weeks pregnant in Bali. 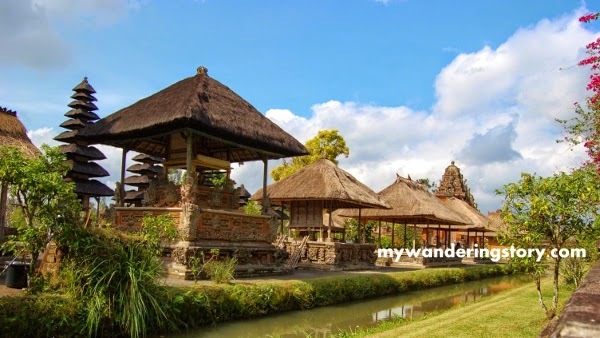 This temple is part of a network of directional temples to protect Bali from evil spirits and it owns beautiful garden terraces with courtyards. During our visit to this temple, we saw quite a bit of Balinese people making offerings and prayers to celebrate Kuningan Day. Quite special, indeed. Beautiful scenery at Pura Taman Ayun. 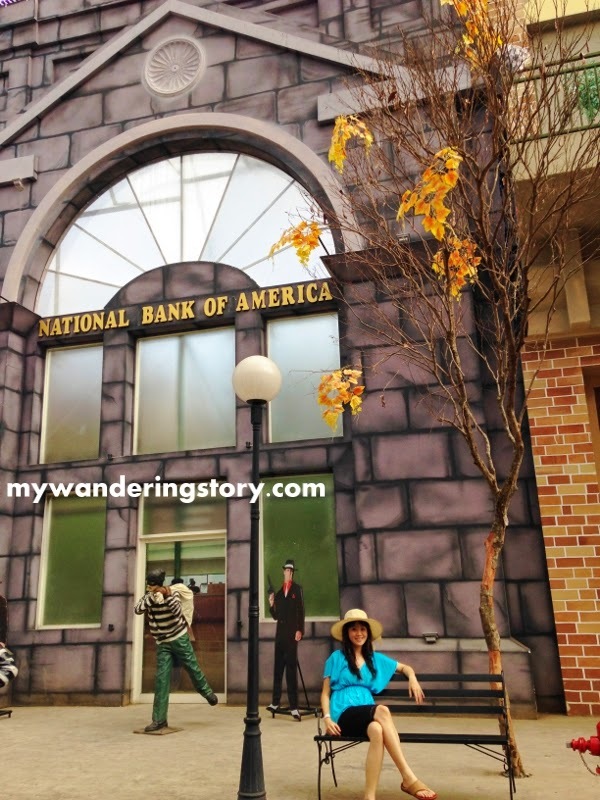 To enter this premise, local visitors need to pay Rp. 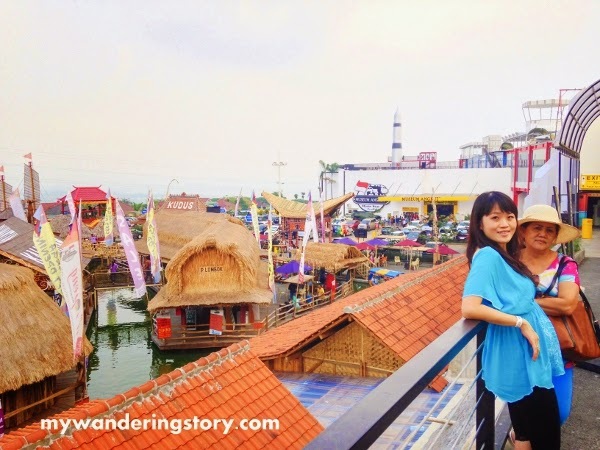 10.000 per pax and foreigners have to pay Rp 15.000 per pax. My parents decided to skip visiting this pura because Naomi was napping in the car so I had a quick look of this temple with my husband. 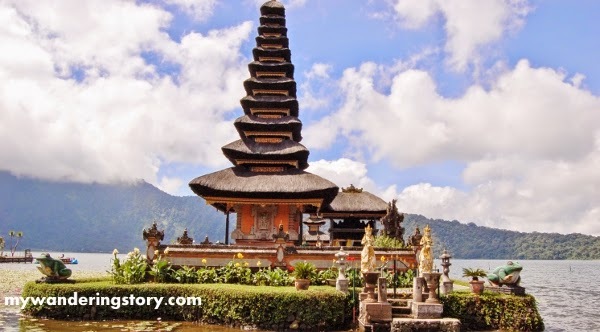 Next, we drove to the north and arrived to another famous tourist attraction and major water temple in Bali, Pura Ulun Danu Bratan, located on the shores of Lake Bratan in the mountains near Bedugul. The tranquil and scenic lake temple in Bedugul. When I set foot at this place, I realized that I'd visited this lake temple back in 2009, not long after I organized a geothermal site visit around Bedugul area. Then, I led an impromptu mini tour with some of overseas conference delegates because our site visit ended earlier than planned and we had rented the bus for a day. I recall I helped a delegate from India bargaining a souvenir for his wife in the market around this temple. 5 years later, I think the surroundings of Ulun Danu Bratan, Bedugul has changed, in a better way. There is now a huge park and kid's playground not far from the lake temples. Naomi was so happy when we took a stroll around the park and decided to let her come out from the stroller and roam around the park. She was so hyper when she played at the park until two American tourists noticed us and began talking to us about how cute and active Naomi is. The Caucasian middle-aged lady ended asking my permission to take a picture of Naomi and I happily obliged. "Naomi, why are you so happy?" My Mom loved to make Naomi sit on top of animals figures in the park, some were creepy looking, and asked us to take photo of them. Naomi sat on a giant lizard statue. 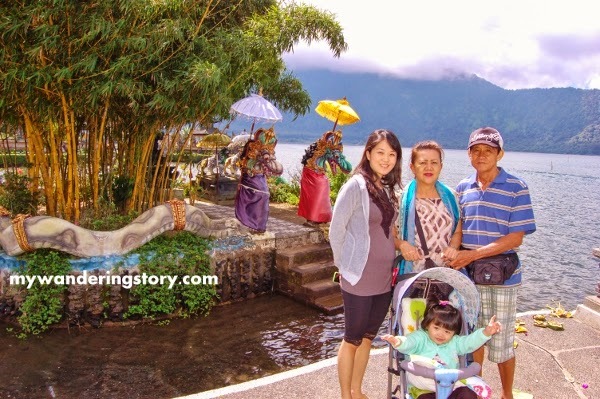 Soon after we explored the parks around the lake temple, we called our visit in Bedugul a day. If I remember correctly, I think the entrance fee to this temple was around Rp. 10.000 per pax. 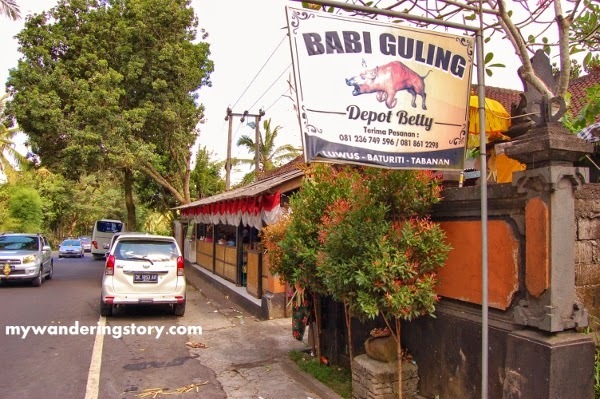 After the Bedugul visit, our driver drove back to the southern part of Bali to reach our next destination but on our way to the next tourist spot, we dropped by a very crowded local restaurant for a quick lunch. 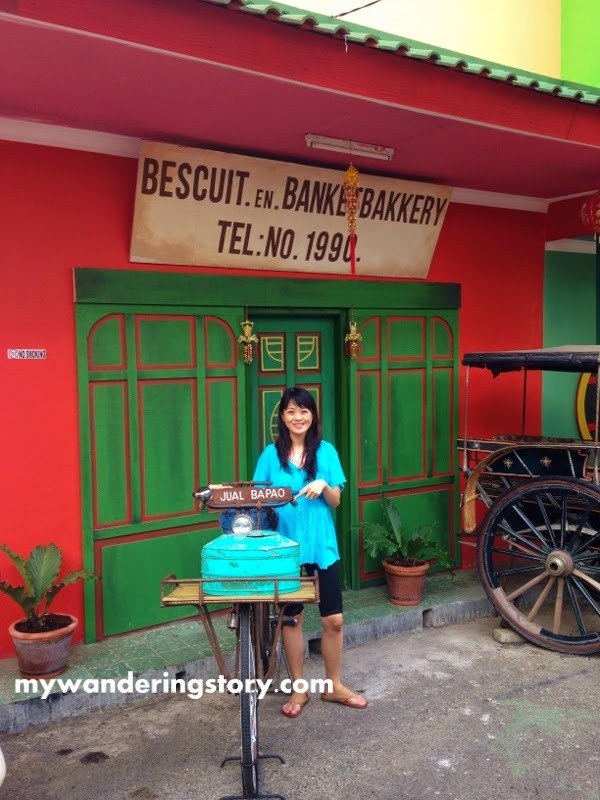 Our culinary tour in Bali began here. The four of us had Nasi Babi Guling Bali (Suckling Pig with Rice), one of Bali's famous dishes. However, I personally didn't really enjoy this cuisine that much (maybe because I don't really eat pork?). To continue our trip in Bali, we're off to check out a Hindu Temple set on a large offshore rock surrounded by seawater, Tanah Lot. In the afternoon when we visited Tanah Lot, it was scorching hot and as one of Bali's most sacred temples and important landmarks, this worship place was just crammed with tourists and local people who were busy making offerings and prayers at the temple. The area leading to Tanah Lot is very commercialized as Tanah Lot is one of the most visited and photographed temple in Bali. 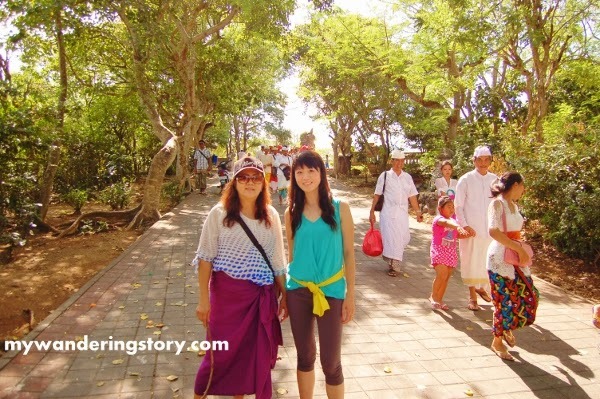 I don't know how much the entrance fee for Tanah Lot because my parents took care of it. By the way, my Mom and I really enjoyed walking through a set of Balinese souvenir shops on the way to the main temple and had our shopping spree there. 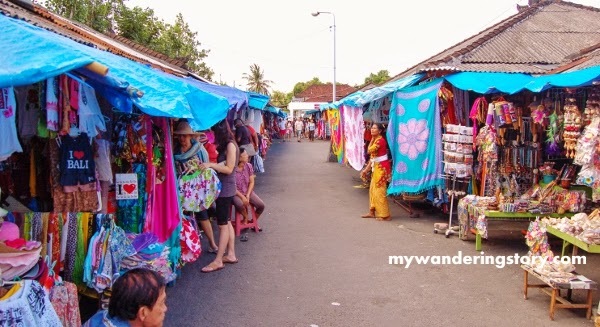 The souvenir market in Tanah Lot. I must say that Tanah Lot is not a stroller-friendly place; hence my Dad, who'd seen Tanah Lot temple before, had to skip checking out this temple because there were so many steps to reach to the main temple and Naomi was napping again in her stroller. Before reaching the main Tanah Lot Temple. The famous Tanah Lot Temple in the background. 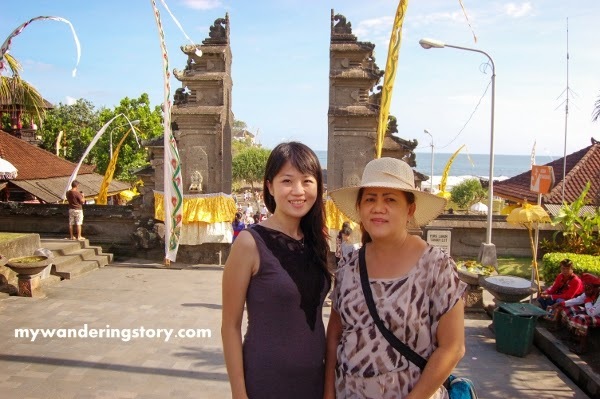 After we gave a real quick tour to my husband at Tanah Lot Temple and took some pictures of it, we left this place and had some some cold drinks at the nearby restaurant on the mainland cliff tops just near the exit of the main temple attraction. My advice for you is to find restaurants that don't nest next to the exit because they ridiculously jack up the price of all the food and drinks. One single fresh green coconut or a cup of hot (instant) coffee can easily cost Rp 10.000 more expensive if you have them from some restaurants next to the temple's exit. Walk further down to find some other restaurants which serve similar stuff and you'd save money! 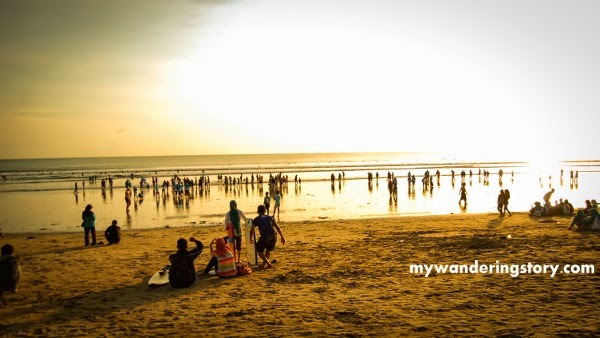 Our last destination before we finalized our first sightseeing day in Bali was Kuta Beach. My Mom and I thought my husband's first trip to Bali would not complete without visiting Kuta, so we opted to have a quick visit to Kuta Beach for its sunset. 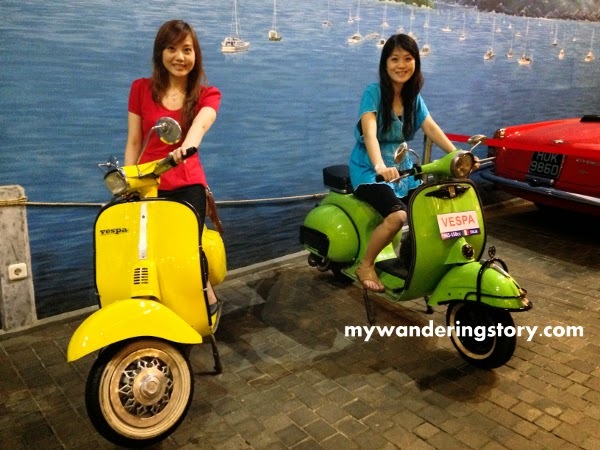 We didn't really take a stroll at the Kuta Square because by evening, we were drop dead tired. I guess only Naomi who was not so tired from the trip because she napped twice that day. Beautiful evening at Kuta Beach, Bali. Also, I must say that Naomi was actually the one who enjoyed the beach the most because she played with the sand, waves and water to her heart's content. The rests of us mostly just sat in a rented mat, enjoyed the beach view and took turn in accompanying Naomi playing water by the beach. My Dad chatted with the guy who rented the sand mat for Rp 10.000/piece. He said he's been renting mats in Kuta Beach since the days where a rented mat for tourists cost only Rp 500/piece. 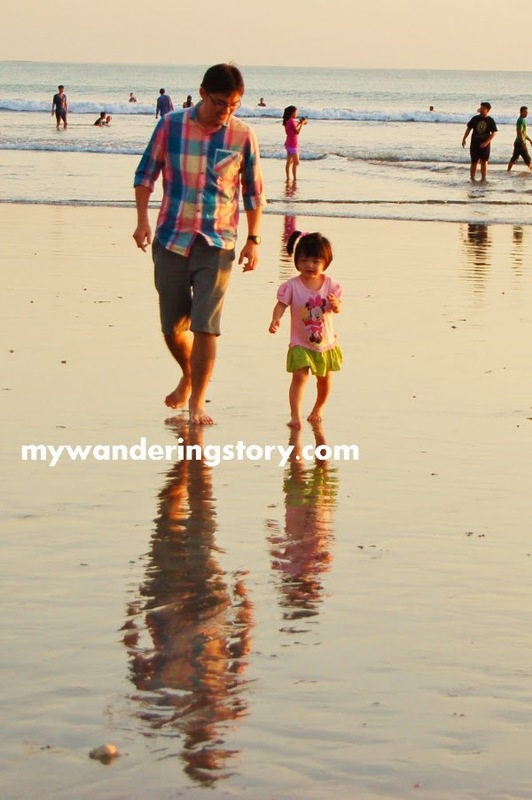 Naomi and Grandpa at Kuta Beach. Albeit the aftermath of visiting a beach is always very messy, I was so glad that I went to Kuta Beach to entertain Naomi because her happy expressions at the beach were priceless! Naomi running away from the waves. On another note, we learned that the water at Kuta Beach was so much colder than the water at Port Dickson or Langkawi beaches, although the weather in Bali was relatively hot that evening. To conclude our first full-day in Bali, we initially planned to go to Jimbaran for dinner but ended up cancelling the plan because we're so exhausted and lazy to go out again. We chose to go back to the hotel and had a dinner at the hotel's restaurant, which cost an arm and a leg! The food was so expensive and 20% of tax and service charge in total was imposed for dining at the hotel. Car Rental: Puri Bali Rent Car. Car rental was Rp 400.000/day for Bedugul Route, including driver for 10 hours and petrol. Driver Overtime cost Rp. 35.000/hour.